The forester and the farmer boy from the Alpl near Krieglach called Peter Rosegger became the most talented author of Austria in the 19th century. To mark his 100th death anniversary in 2018, Austrian Post has dedicated a commemorative stamp to this extraordinary writer and teacher. Peter Rosegger was born in 1843 in Styria and as the oldest of the seven, all reasonability of the family was on him. Due to this, he was not able to attend school regularly. Later on, when he learned about tailor trade, he started working as a travelling tailor. His work gave him the opportunity to visit many people and learn many things about their lives. This adventures and exploration gave Peter a passion for reading and writing his own stories and poems. Yet, this great and interesting journey was never able to lower his affection towards his home. His work “Waldheimat’ and novel ‘Jakob der Letzte’ describes the wonder and beauty of his homeland in great detail. Peter received many awards for his wonderful work; he received the noble prize for literature. 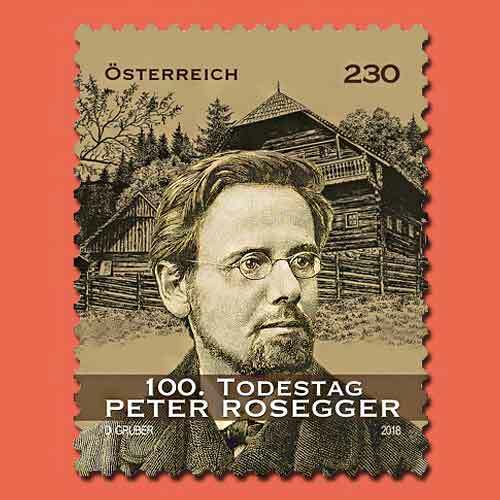 On 26th June 1918, Peter Rosegger dies in his home in Krieglach, his contribution to the literature had a lasting effect on the region of Styria.